Our new 1410 1Y 3800kv motor brings an extra wallop to those larger 1/10th scale vehicles such as 2WD and 4WD short course trucks and AWD 1/10 buggies and truggies. 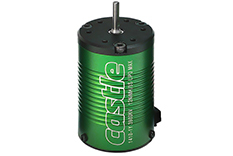 This motor is definitely a step up from our famous CM36 series. The rotor and stack are about 40% longer than the CM36 and the 1406, and the rotor is our newest four pole design for increased torque. This is the motor sold in our SCT combo with the Sidewinder SCT controller. In that combo, we suggest 2S as the maximum cell count in order to keep the controller happy. 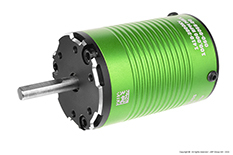 Use this motor with our Mamba Max Pro at higher cell counts (and different gearing) to achieve unbelievable performance. Don't forget to add some cool to your motor with the CC Blower fan shroud!